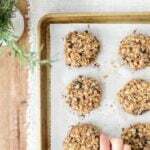 Banana Oatmeal Breakfast Cookies are nutritious, tasty and super easy to make. They make perfect grab-and-go breakfast for busy mornings. Who wouldn’t love cookies for breakfast? Although we all know breakfast is important to start the day, most of us are likely to skip it because we don’t have enough time or energy to prepare something to eat in the morning. That’s why we are usually after grab-and-go options. If you are one of those who want to have a quick yet satisfying breakfast, you are at the right place. 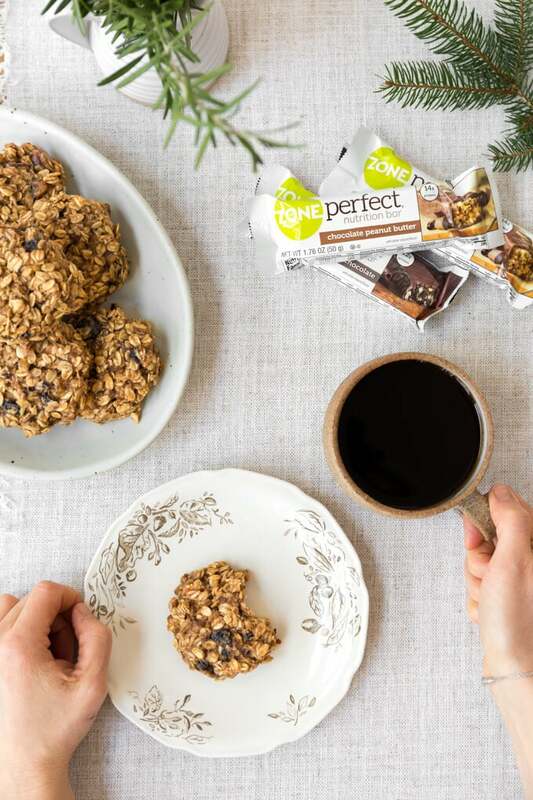 These oatmeal breakfast cookies with banana, peanut butter and ZonePerfect® Nutrition Bars would be a smart start to your morning. ZonePerfect® Bars already make a great-tasting snack during the day. You know there are times when you start to feel hungry in the afternoon, especially when you still have some work to complete. It is always better to have nutritionally rich products on hand for those situations. This is the reason why we always buy ZonePerfect Nutrition Bars whenever we go grocery shopping. You can easily find them by visiting their “Where To Buy” product page. My favorite flavors are peanut butter and dark chocolate but I think they all taste good. If you haven’t tasted them yet, go to their product page and find your favorite flavor there. Knowing that these bars are perfectly nutritious, I had been thinking of including them into our breakfast routine for a long time. Then the idea of this recipe came to my mind when I was testing a new oatmeal breakfast cookie recipe last weekend for our busy mornings. I was preparing the ingredients for the cookies that day. Bananas, oats, peanut butter, egg and honey were all on the counter but I knew something was missing. Guess what happened then? The ZonePerfect Bars on the other side of the counter started to call my name. Then, I roughly chopped my dark chocolate and chocolate peanut butter ZonePerfect Nutrition Bars and included them to the ingredients. Why I love ZonePerfect Nutrition Bars is that they have no artificial flavors or sweeteners. They make perfect match with my cookies. 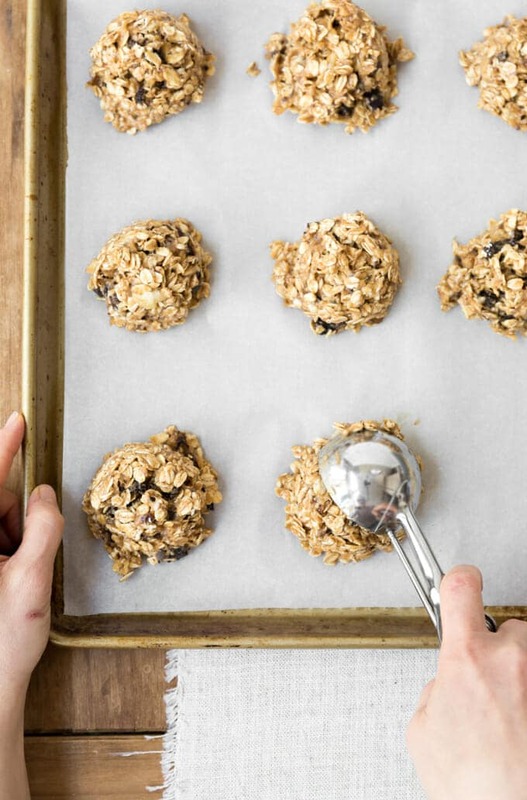 These nutritious oatmeal breakfast cookies are like eating an oatmeal bowl in cookie form. Much easier to grab one and go. What’s more, it’s really a straightforward recipe and the cookies are done in under 30 minutes. 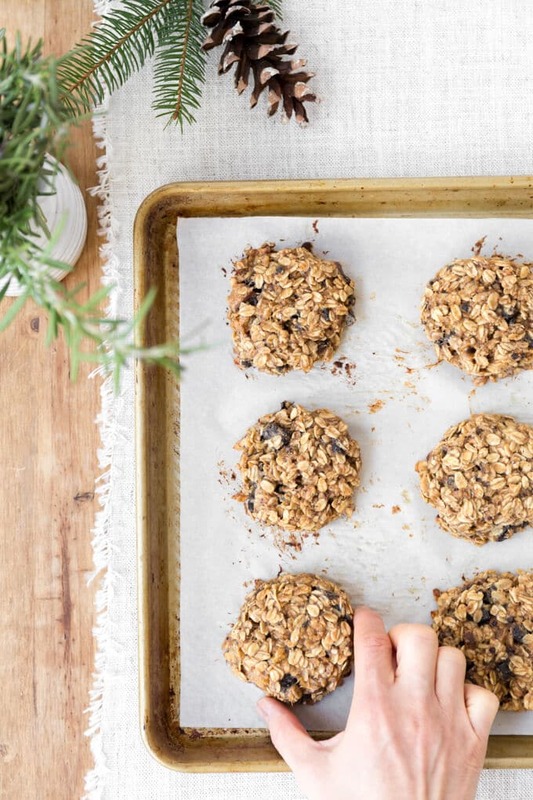 These oatmeal breakfast cookies are life changing in the mornings. Since they are protein packed, they keep us full until lunch time. I hope your family and you love these simple nutritious cookies as much as we do and breakfast gets easier to handle for you on weekdays. I baked them for 21 minutes but they looked under-baked when removed from oven. Don’t worry! Just let them cool down in the baking sheet and they will set. You can try this recipe with different flavors of ZonePerfect Nutrition Bars. You can enjoy the cookies with some milk or yogurt and coffee for breakfast. The cookies freeze well in freezer bags. Banana, oatmeal and ZonePerfect bars make a wonderful on-the-go breakfast. Preheat oven to 325°F. Line two large baking sheets with parchment paper. Set aside. Add everything to a large bowl and mix together with a rubber spatula. Scoop mounds of dough, about ¼ cup each, onto baking sheets. The cookies won’t spread much in the oven, so gently press the mounds down to create a flatter shape. Hi there! Does this recipe take one of each kind of zone bar or is it either one kind or the other. You have one in bold and one note, so Wasn’t sure I wanted to check before I made this recipe. Hi Abbie, I use both chocolate peanut butter and dark chocolate flavors. I follow the Weight Watcher food plan and by my calculations this bar has 11 points. A lot to me, but they sound delicious. I love these breakfast cookies! I substituted the honey with maple syrup and they came out perfectly! I have been looking for healthier breakfast treats and these satisfy my banana bread and chocolate cravings without all the added sugars and oils. Hi Madilin! Glad you like it! I thought vegan was plant based and this recipe uses dairy such as eggs and whatever else is in the chopped breakfast bar. Hi Kathalina! This recipe is not vegan for sure. I don’t know what made you think that it is vegan.